If your business, church, team or even family is looking for the ideal truck that works as hard as you do, you are in the market for a Built Ford Tough commercial vehicle. From vans and passenger wagons to pickups and cutaways, we have a tough and rugged vehicle that can meet your needs. Offering the flexibility to fit any business by offering a cargo van or passenger wagon plus your choice of three roof heights, three lengths and two wheelbases. Available in 8, 10, 12 and 15-passenger models, the Transit even does everything from hauling cargo to transporting people. Also available is the choice of three engines along with a seemingly endless list of up fitting options. Available with a 3.7L TI-VCT V6, which delivers 275 HP and 260 lb.-ft. of torque; 3.5L EcoBoost V6 and a *best-in-class V6/V8 maximum gas torque rating of 400 lb.-ft. and a direct-injected 3.2L I-5 Power Stroke Turbo Diesel, which delivers Ford diesel ruggedness and dependability. Each Transit is also engineered to any brutal job that you can throw at it. In fact, Ford has subjected seven million customer-equivalent miles of brutal testing in our labs and proving grounds, on roads and highways, across America. Even at temperature extremes of -40 to 120 degrees Fahrenheit the Ford Transit can take on the toughest challenges of strength and dependability. It is easy to see why the 2017 Transit Connect is America’s best-selling commercial van. Loaded with up to 149 cu. ft. of storage and a 1,610-lb. 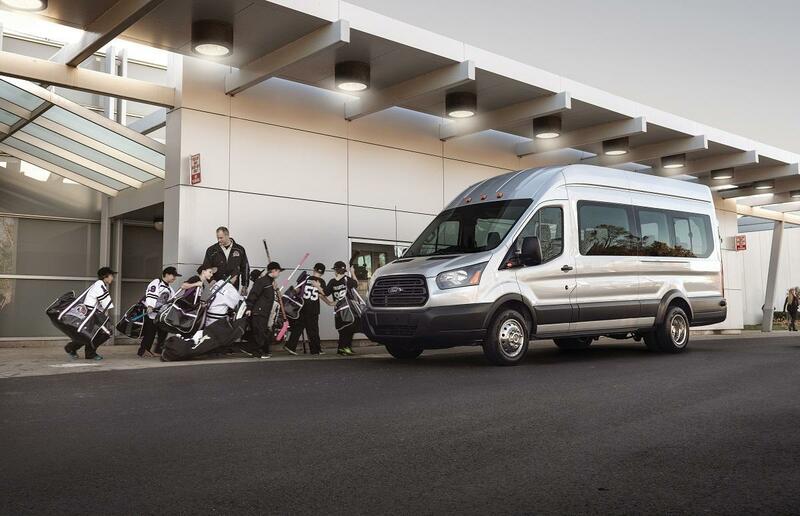 payload rating as well as best-in-class maneuverability the 2017 Ford Transit Connect even offers the most flexible seating in its class. What would a connected vehicle be without added technology? This commercial workhorse has all the bells and whistles that you could ask for in this area. With Ford’s SYNC 3 easy-to-use, responsive voice-activated technology with conversational voice commands and smartphone-like touchscreen with impressive responsiveness to find each work location as well as the perfect travel music for each job. Along with an easy-to-use rear-view camera, you can assure that this cargo van can get you and your cargo where it needs to go safely. This American built and assembled work truck, with 12 up fitters located within 30 miles of the assembly plant, is designed for quick and easy body installation with zero add-on parts needing to be removed and reassembled. Available with a 3.7-liter V6 that delivers responsive power and twin independent variable cam timing (Ti-VCT) technology. For cleaner driving to each work-site, the Transit CC-CA is also available with a CNG/Propane Gaseous Engine Prep Package on its 3.7-liter engine for power conversion to compressed natural gas (CNG) or propane autogas. Built with high-strength military-grade aluminum-alloy, the best-in-class 2017 Ford Super Duty is lighter than steel yet strong. With stronger axles beefier suspension components, and a fully boxed under-cab and C-channel aft-of-cab frame built of 95 percent high-strength steel with eight times more torsional stiffness than the previous frame. With an Upfitter Interface Module the Ford Super Duty’s CAN programmable logic interface makes using a laptop or notebook easy on the job. The E-Series Stripped Chassis is built for the toughest jobs possible. With a powerful 6.8L V10 engine, propane gaseous engine prep package for cleaner hauling and a monstrous tow package this Ford commercial truck is built specifically for work and nothing else. Built with a 6.7L Power Stroke V8 or class-exclusive V10 gas engine that delivers best-in-class standard 270HP/675 lb.-ft. of torque, plus available engine outputs of 300-330 HP with 700-725 lb.-ft. of torque. Along with being a powerful work truck, Ford paid great attention to the noise levels along with providing ultimate comfort, refinement and ride quality of this true Ford workhorse.